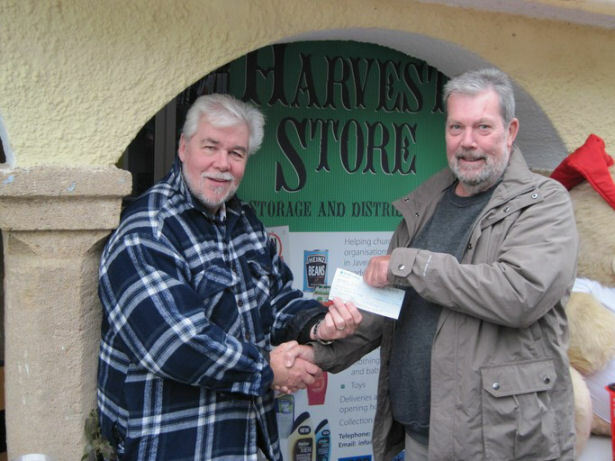 The photo shows Richard Wareham, Treasurer of the Javea Computer Club presenting a cheque for 700 euros to Peter Cox of The Harvest Store, Javea. 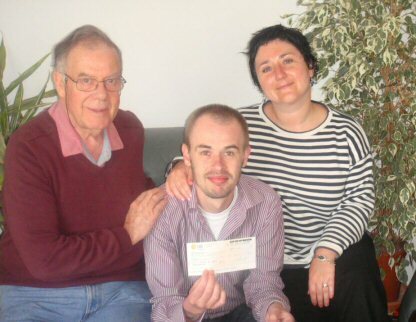 The cheque was presented at the Christmas Fayre, Xabia International College - where Peter is one of the teachers. The aims of the The Harvest Store are to provide free at point of need, food, baby products, baby & children’s clothing to those who find themselves in disadvantaged circumstances. 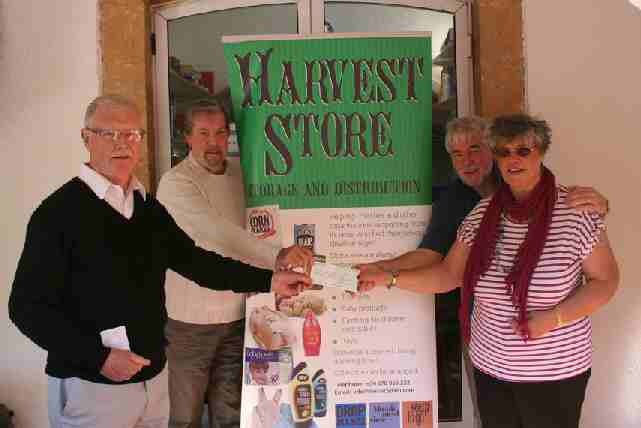 The Harvest Store distribute food and clothes to the 'needy' of Javea. They are based in the Javea Port Market. 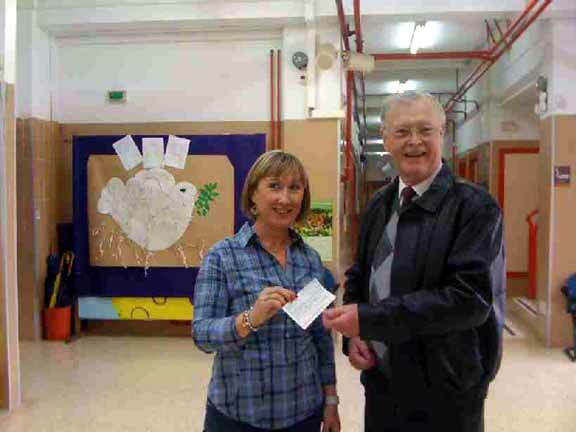 The photo shows JCC President, Morris Gray and Treasurer Richard Wareham handing over a cheque for 850 Euros to Tricia Cox of The Harvest Store during the Xmas Fair at the Xabia International College. 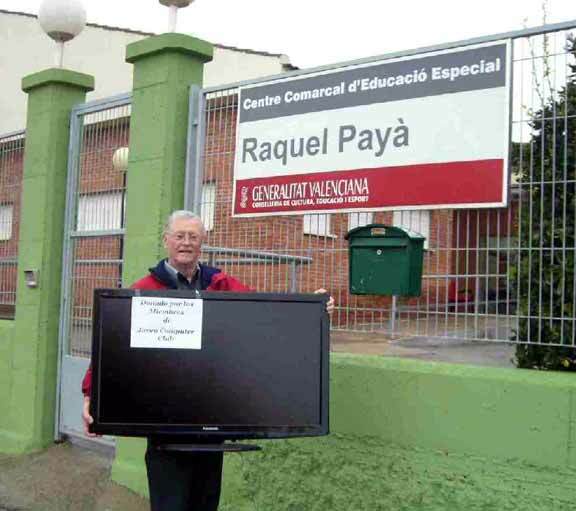 The Charity chosen by the Committee in June 2010 was the Raquel Paya School for Children with Special Needs in Denia. In view of the excellent, and very worthwhile, service that the School provides, JCC has decided that the School will be the Club's chosen Charity again for year 2011/2012. Have a look at the School's Web site HERE. The first picture shows JCC President, Morris Gray, handing over a cheque for €1,327 to the School's Director, Teresa Marti. As a result of the generosity of the 136 members, who attended the JCC and answered Morris's appeal, we collected a further €597. This was to buy a decent sized TV for the children who attend the school. On behalf of Morris, the members of the Committee, and the children of the school, a big Thank You Members!. The second picture below shows the 42" TV being delivered to the School. March 2011 The caption, on the TV reads - "Donated by members of the Javea Computer Club"
Not exactly the JCC charity, but several members supported this event that raised €2150 to help Chris have the chance to have a ground breaking and potentially life saving new operation in Poland in November this year. Unfortunately this operation, which was recently reported on by the BBC news, is still only available privately and at a substantial cost. The 6 readers completed the task of reading in turn continuously for 8 Hours,with Chris himself reading from his own novels at the start and the end of the read. Many people were involved in the event and in raising the cash, and our thanks go to all of them, and our thanks also go to Bodywise , Javea Golf Club and Lisa Fox for donating prizes for the contributors. To read a full report on the event please go to daviddecker.net and click on the Chris Hales Read-in button. We will keep you all updated on Chris' progress." Each year the Javea Computer Club members collect donations for a local charity. For the year June 2009 to June 2010 the nominated charity is the Javea Day Care Centre Centro de Día Santa María de Betania. Initially the centre was to have been for Alzheimer's patients, but the remit has been widened to include other incapacitated people because people with different disabilities tend to mix and help each other. It is located at the Convent in Javea Old Town and is be run by the nuns with Mother Sara and Sister Alicia in charge. In November the club donated 740 Euros to the Day Care Centre and in December when the centre opened the club donated a further 750 Euros. 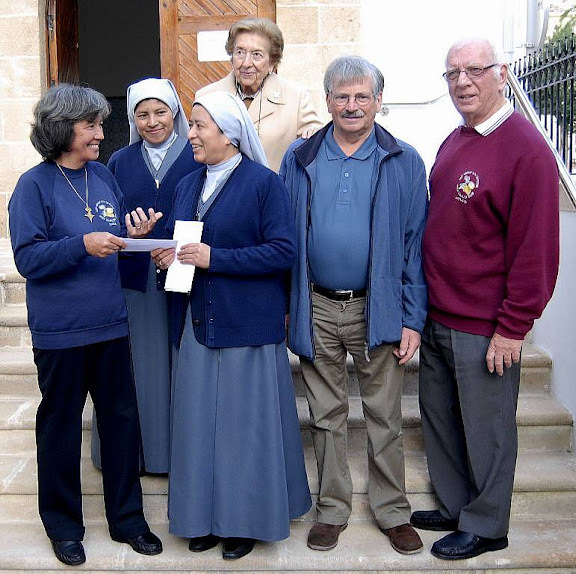 The picture shows Chris Betterton-Jones, President of the JCC presenting the second cheque to the Sisters, who run the centre. Vic Tattersall and Mike Easter, of the JCC, also attended the opening. This money was raised largely through the efforts of the hardware group who received donations from members expressing their appreciation for help or for second hand computer hardware. Money was also raised from a raffle for a copy of Windows 7 and a raffle at our Christmas Party. Contributions have also been received from sales of cards made by the card making group. Mick Scarles Hair Cut ! On December 11th 2008, JCC member Mick Scarles had his 7 year long hair chopped off to raise money for the Javea dogs' home, APASA. He raised over 800 Euros and is hoping for more donations to make three figures. Well done Mick! - you can re-live the event here!…and thanks to Rob Westlands of the Video Editing group for creating such a fun video.